We haven't been doing anything too exciting, but we're so glad it's cooling down here. -She is so happy and smiley whenever we go get her out of her crib. -She is sleeping pretty good and night and during the day. -She eats a little bit of fruits and vegetables, but not much, maybe a couple tablespoons everyday. 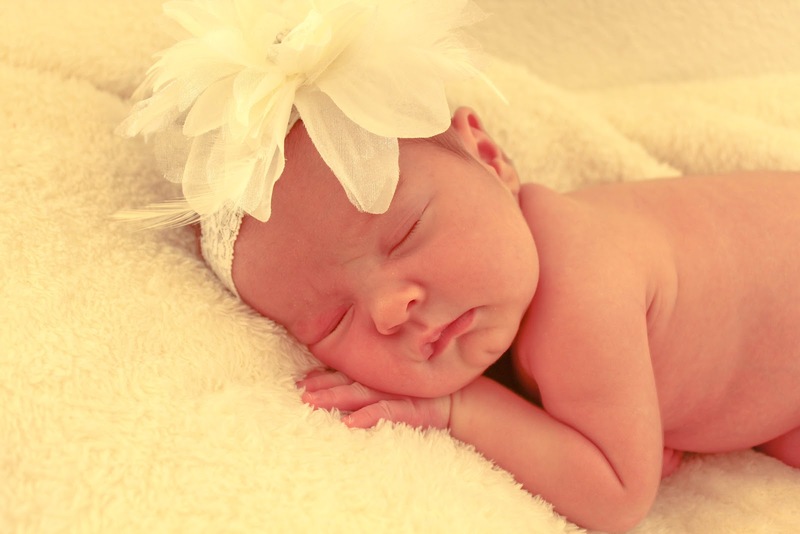 -She has dark hair and dark eyes like her dad. -She's starting to grab everything in reach and has knocked over a few glasses of water at dinner. -She is the most smiley baby I have ever seen. -She is sitting up pretty well, but not independently. -She loves kicking her legs and can really get her bouncer going. We love her so much and are so grateful to have her and Jacoby. I love seeing Tyler with Hallie. He calls her "little Sue" or "pretty girl". Jacoby loves having someone around to "play" with. It's so fun to see them interact. Notice Jacoby's shield that never leaves his side. This is super Spiderman Captain America Batman Ninja Turtle Dracula. (The dracula teeth are under the mask.) He thought of this on his own. Silly guy! Love this sweet bow from my mom. Grandma Debie just sent this Captain America costume for Jacoby for Halloween. He is thrilled and won't take the thing off. 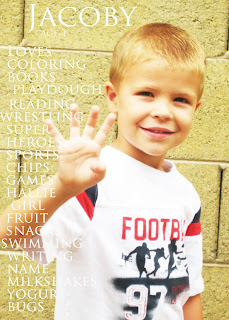 I cant belive that we have a four-year-old. We had a fun time together celebrating his birthday. This year was really fun and he was excited about his birthday and really knew what was going on. He got so many nice gifts that he loves. Tyler was out of town for his birthday so before he left we did milkshakes and opened some presents early. On his birthday we Skyped all day long with all of our family. He loved that and loved getting presents on the mail and still asks for "packages." Oh man. I took him and a friend to McDonald's for kids' meals and we had cupcakes with lots of sprinkles. Jacoby is such a fun boy and we're so grateful to have him in our family. He is all boy and can be really wild but he is a sweet boy who thinks about others and is very outgoing. 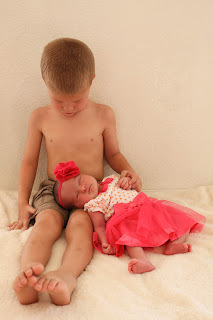 He is a great brother and loves Hallie so much. He's been such a good helper with her too. Happy birthday, bud! I'm getting pretty bad about posting, but wanted to try to catch up a little. It's been so busy having two now, but so fun. We've made a couple trips to Idaho in the past couple months and it's been so nice. We love seeing our families! Hallie is growing so much and is so fun. Jacoby loves her so much and is so sweet with her. He says the nicest prayers about her and says things like, "thank you for Hallie" and "thank you Hallie is so beautiful" and "thank you Hallie loves me and I love her." Prayers at our house can get pretty long. We love these two and are so grateful for them. When I was pushing Jacoby on the tire swing I was saying, "Whee" and Hallie was laughing. Jacoby loves seeing Hallie smile so he had a huge smile on his face. These two looked pretty adorable on the Fourth of July. We had a fun day as a family! My mom took these newborn pictures of Hallie while she was visiting last month. I love them, thanks so much, Mom! Jacoby loves his dad and whenever he gets home from school he can't wait to play with him after dinner. They love to play soccer and baseball out on the grass. 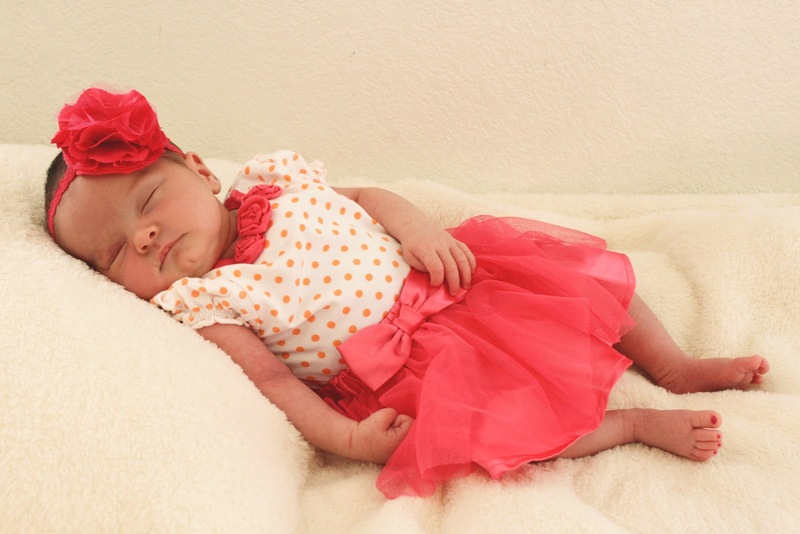 Our sweet Hallie Sue Roe was born last Tuesday, March 20th, at 1:32 p.m. She was a teeny little thing and weighed 6 lbs. 6 oz. and 19.5". Jacoby was almost a whole pound bigger than she was. I was two weeks early and we were not expecting her to come this early, needless to say, I wasn't as prepared as I should have been. My water broke around 4:00 a.m. and I was a little unsure of what was going on, but soon realized that there was no mistaking it, my water really had broken. We went to the hospital, took Jacoby, just to make sure it was for real and they did a test and found out that I was in labor. Tyler took Jacoby to our friends' and came right back. My contractions we're hurting at all at that point. 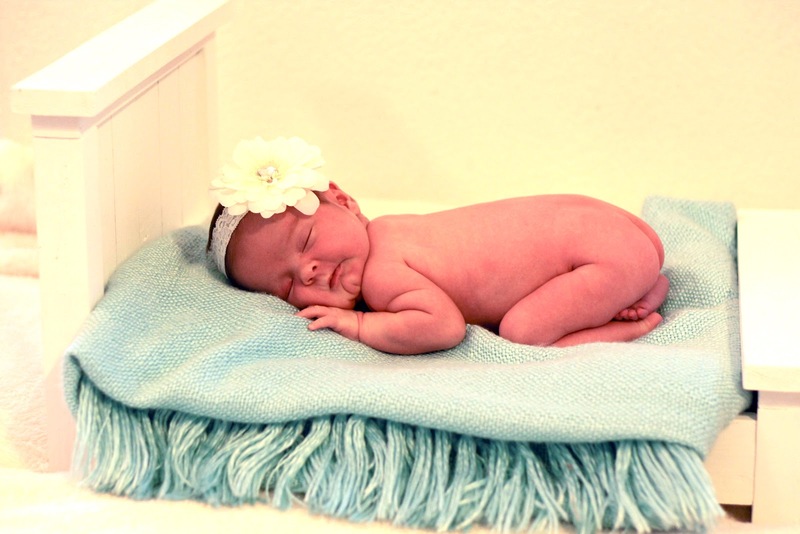 They started me on Pit to make things go a little quicker and I was able to get my epidural just when I had started feeling painful contractions. So much better than with Jacoby. Things went really quick from there and she was ready to come. Tyler had actually gone to get some lunch when the nurse checked me she said, "Where is your husband, you're ready to have your baby." Ah, luckily he was in the parking lot. Things went so well and we're so grateful she was healthy. We've been waiting a long time for her and are so happy to finally have her. 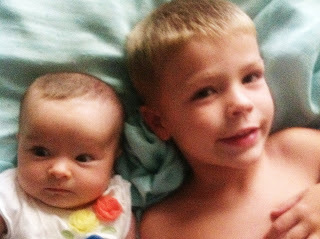 Jacoby just loves her; it is very sweet to see them together. He does miss all the attention because it was just him for so long and he's sick of staying home all the time since we are usually going to parks, walks, bike rides, and activities everyday. Luckily, so many of our friends have been so great to have Jacoby come over and play. Friends and family have been SO WONDERFUL since we had Hallie and I will never forget all that they have done for us. I love you all! Tyler's mom and little brother were able to come down right after she was born to help us out. It was so wonderful to have help with Jacoby, the house, cleaning, and meals. Debie even got me flowers, Cadbury Eggs, and a package of cookie dough. Taylor grilled us some yummy medium steaks I've been craving. :) We're grateful they could come help us out. It was actually a good time in school for Tyler for Hallie to be born, so I'm thrilled about that. We've been able to see him a lot more lately. I love seeing Tyler with Hallie; he is such a great dad. 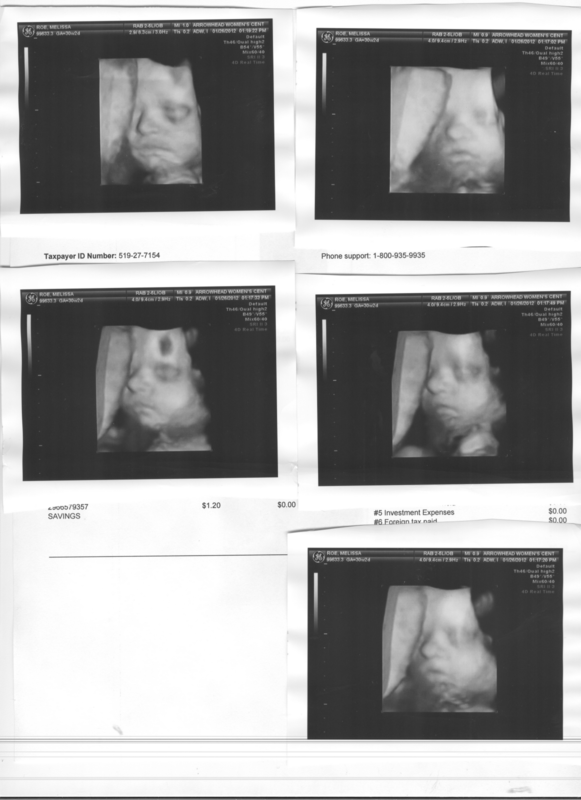 As you can see in the pictures, Hallie has a little dimple in her chin. We have been wondering where it came from and figured out that my Uncle Daren has one and also Tyler's Grandma Sue that passed away, that she is named after. We realized this after we had decided on the name. I thought that was pretty special. It has been really difficult to be away from family right now. I just want everyone to be able to see my baby, but we will go home soon. My mom comes on Sunday and I can't wait! Thanks to my mom who took these pictures while she was here visiting a few weeks ago. Man, it was awesome to have her here. I love her and miss so much. She helped me with so many things and she is just the best. maternity clothes: Yep, and I'm getting real sick of them. miss anything: Yes, lately I've really been wanting a steak cooked medium. We went to Texas Roadhouse a week ago and I had to settle for some chicken critters. I know where I'm going in a month. movement: Yes, I love feeling her move, it never gets old. A new thing is feeling her hiccups, love it! food cravings: Well, besides a good steak, just chocolate still. anything make you quesy or sick: Just some smells and if I don't eat regularly. labor signs: Just Braxton Hicks contractions when I'm walking a lot. looking forward to: Not feeling so guilty when I don't eat very healthy. I always feel bad when I don't get enough vegetables and eat too many treats. It'll be nice to not stress about that. It'll be nice to sleep on my stomach again. I can't wait to see Jacoby and Hallie together for the first time. aches and pains: My sciatic nerve has been making me really uncomfortable. symptoms: I still have quite a bit of energy, just getting anxious. 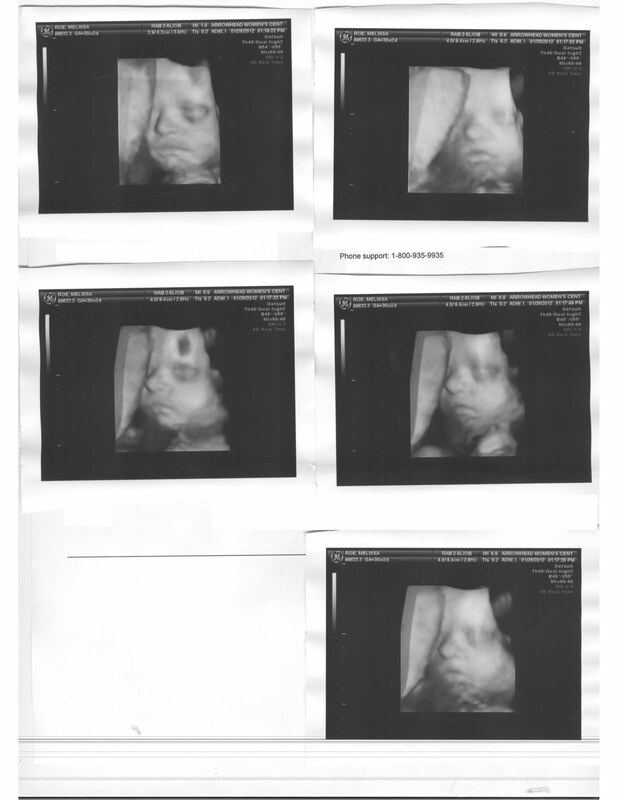 I was so excited to go in for the 3D ultrasound this week. I thought Jacoby's was fun, but they only did one picture. They were so nice and spent a lot of time with me really trying to get some good shots of her sweet face. In the beginning she was holding onto her foot and had it up by her face so you couldn't see her very well. We finally got her to put it down and they got these really great pictures. It was so fun to actually be able to see what she might look like. She looks like she has some lips, which she probably gets from her dad. They printed off about 20 pictures for me and I said, "Wow, that is a lot of pictures, thank you." She said, "Yeah, why don't you fold them up so that noone feels bad that you got so many." I thought that was really nice of them to try and get some good pictures for me. I also got a DVD of the whole ultrasound. We're so grateful that she's growing the way that she should and is doing well. 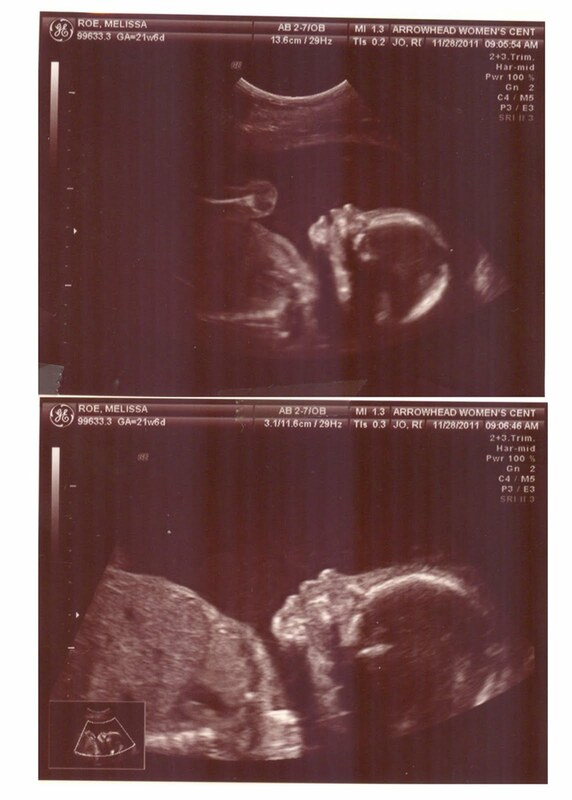 We can't wait to meet her in 10 weeks! Jacoby took this picture. It took forever for him to get this one, and I don't even like it but oh well. He thought he was pretty important. I thought it was time I did a little update on how my pregnancy is going. Mainly just for myself and maybe my mom and sisters to see some pictures. We're getting so excited to have our little girl and have been getting a few things ready. We brought back a bunch of baby stuff at Christmas that we had left in Idaho. My grandparents were able to bring some bigger items, which we appreciated so much. I've been working on a few projects for her: blankets, burp cloths, bibs, her quilt for her room, and some headbands. We've already decided on her name, Hallie Sue. Sue is after Tyler's Grandma Sue who passed away and it sounds great with Hallie we think. Tyler and I have loved it since we were expecting Jacoby, so we are pretty set on it and I've already started monogramming things. :) Jacoby talks about her a lot and doesn't know why she can't come out now. He's going to be a great helper to me, he's very sweet and caring with babies. maternity clothes: That is all I can wear now, and even my long stretchy shirts are starting to show my big belly at the bottom, and that isn't attractive. told family and friends: Yes, we told at 16 weeks. miss anything: Yes, I miss hot baths, cookie dough, my regular clothes, painting my toes comfortably, and sleeping on my stomach. movement: I feel her moving all the time. I can feel her little bum or a knee staying in one place too. Feeling her move all day makes me so happy. Tyler teases me for always having my hand on my stomach. anything make you quesy or sick: If I don't eat regularly I get really sick and throw up. Have you started to show yet: Oh yeah, I think it was very obvious at 4 1/2 months. happy or moody: Mostly happy, I'm feeling good right now. aches and pains: Yes, I do get those ligament pains pretty often. We enjoyed a great trip home for Christmas and were sad to leave. We had so much fun with our families and were so happy we could go home for Christmastime. We did so many fun things that I can hardly remember everything. Grandma Debie helped Jacoby make some donut snowmen. He loved it and felt so important. Jacoby's elf, Bernard, came to meet him from the North Pole. He did all sorts of funny things. (Bernard is an elf's name on The Santa Claus.) Since Jacoby is such a boy and likes to talk about bums and undies, he thought this was extra funny. Other things Bernard did: drew faces on a photo of Jacoby, held baby Jesus in a nativity, wore the reindeer glasses, drove the pirate ship, had a snowball fight with his cousins' elves, and hung from a light. I think he's really scary looking, but it was fun to do and Jacoby loved it! We went bowling a couples times and Jacoby even managed to get a few spares. Had lunch with my mom and the "big girls" for Janet's favorite things. My parents spoil us with gifts of some of my mom's favorite things. It is always a blast. Our bags full of goodies. Jacoby was excited about his dinosaur pajamas and so excited for Christmas the next morning. This year was so fun with him! I just love to look at him when he's sleeping. Too bad he doesn't stay like this for long, he is not a good sleeper. Ha. Rudolph sucker from his stocking. Tyler and Jacoby on Christmas afternoon. Jacoby was excited that Santa brought him two Nerf guns so that him and his dad can shoot each other. Oh he loved opening presents this year. Jacoby on his Wiggle Car. He loved wearing this bathrobe around. They acted out the nativity and he was a shepherd and wore this robe and never wanted to take it off. We're so grateful for this Christmas season and the opportunity we have to think of Jesus. I feel so blessed for all the I've been given. Spending time with family at Christmastime is what it's all about and it makes me realize what is most important in life. I'm grateful for all of the wonderful gifts we received. We can't believe that next Christmas we will have a four-year-old and an eight-month-old baby girl. We couldn't be happier! Randi, Brock, and Paigey Poo! hippity hoppity Easters... already been here? Burt’s Bees Essential Everyday Beauty Gift Set, 5 Travel Size Products – Just $5.46!